Zeb was exposed to a myriad of environmental issues by growing up on a farm in the Susquehanna Valley of Central Pennsylvania. He began his academic career at Lycoming in general biology and moved into aquatic sciences due largely in part to involvement with Trout Unlimited’s West Branch benchmark sampling project. Now recently graduated from Lycoming College with a B.S. in Biology, Zeb intends on pursuing graduate school in elasmobranch ecology or a related field. In his free time Zeb enjoys SCUBA diving, kayaking, and fishing. Nicole Lundberg has recently graduated from Juniata College with a B.S. in Environmental Science. Her work in the field includes the Pennsylvania Fish and Boat Commission’s Unassessed Waters Initiative, involving the presence or absence of wild trout populations, and assisting Trout Unlimited staff with technical assistance grants. Her goal is to receive her M.Sc. from Louisiana State University’s department of Renewable Natural Resources. 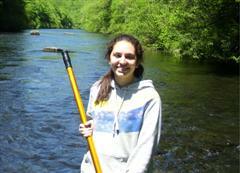 Nicole’s internship is sponsered by Trout Unlimited. Melissa Tesauro is a recent graduate of Juniata College with a B.S. in Environmental Science with a minor in Geology. 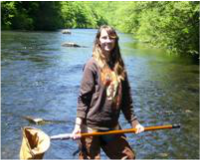 Her internship work includes the Pennsylvania Fish and Boat Unassessed Waters Initiative, which involves determining which headwater streams hold viable wild trout populations. She will also be helping TU staff with technical assistance grants. 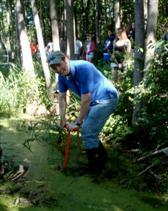 Melissa’s internship is sponsored by Trout Unlimited.